Eva lives in an Inuit village in northern Canada. In the winter, people search along the bottom of the seabed beneath a thick shelf of ice for mussels to eat. Eva usually helps her mother, but for the first time, she’s going to go by herself. She soon gathers a pan full of mussels. But then, her candle goes out, and the tide threatens to return! When she is finally safe with her mother, Eva proclaims, “That was my very last first time walking alone on the bottom of the sea.” --Amazon description. I had also planned it this week thinking there would be snow, but of course we were graced with temps in the 40's-50's earlier in the week! Not until Thursday did we get some pretty, wet, cold stuff falling to the ground... and we have LOTS of it now! Located the Ungayva Bay on our map; learned that it was part of Canada-- our neighbor to the North! Learned about Inuit's (Eskimos, as I was taught); how they dress, what they eat, how they travel, etc. T filled out a Inuit Culture Shape book found at HomeschoolShare. "Nothing. I don't want to do anything by myself." Me: "You always want mommy and daddy with you?" In AAS, we have worked up to Lesson 11 and I thought now would be a great time to step back and really hone into those CVC words with short vowel sounds, so I pulled out our Explode the Code workbook and we will be picking up where we left off. T began ETC in the middle of the summer, but we stopped as he just wasn't ready. Now he is able to put sounds together to make words and read... when he wants too! Polar Bear Sight Word Fishing game: T became a Polar Bear and fished out sight words and then recorded them on paper. Seashell Addition: Using seashells, we completed addition problems and then used his answers to fill out a crossword puzzle. It was actually an Alpha Activity Worksheet. It was great math and reading/spelling exercise as he had to write the number word to complete the crossword. I wrote the number words at the bottom of the page as we have only reviewed words 1-4, but he did really well sorting it all out. Although, the crossword puzzle threw him off as he realized some letters were already in the puzzle, if that makes sense! Ordinal Numbers: used T's collection of Monster Trucks to review Ordinal Numbers up to 12. He did great! Polar Bear Painting: I saw this idea and just fell in love! Love how it turned out! Pointillism Painting-- A big thanks to another FIAR family for mailing some spikey balls that she had her daughter use for their "row!" I left a simple comment thanking her for a great idea-- and she went out of her way to make sure we had the same kind of fun! And indeed, T had lots of fun dabbing the dots all over the place! Supplies needed: Egg carton cut into individual cups, hot glue (be careful! ), white paint. Start making the base and pile on egg cartons on top. Paint igloo white and add some glitter, too! Have fun! Melt and Freeze Experiment: this was not as easy as it looked... or maybe we just have major issues, but it took lots of salt and big puddles before we were able to get the ice cube to freeze onto the string! Polar bears and blubber: used this cute recording worksheet to find out that blubber keeps Polar Bears warm. T was amazed that his hand covered in "blubber" didn't feel the cold icy water! I tried it the experiment, too! I think I need some blubber to deal with this cold weather that has just arrived! Tides: tried re-creating a tide in an baking pan. 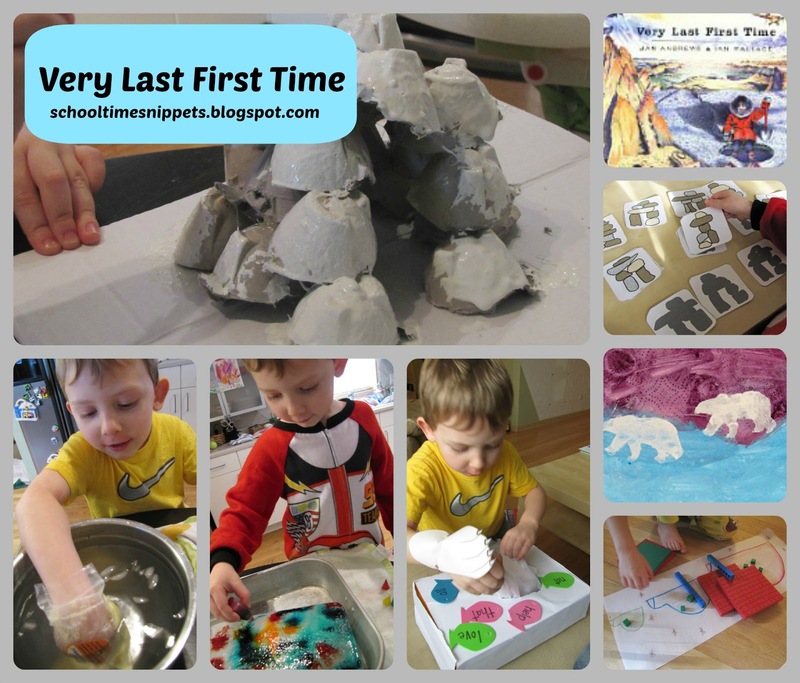 We stuck several "rocks" on the "Ocean floor" with white putty. I then filled up the pan 1/4 of the way, covered it with ice (aka saran wrap... which created a mess!) and cut a hole in it like Eva and her mom did so she could go pick mussels. I tilted our pan and put our Inuit, from our Arctic toob, thru the hole to show what it was like for Eva... and then I tilted the pan back and explained that if Eva wouldn't have gotten out in time... she wouldn't have made it out : ( He seemed to get it, but then again I probably ruined the experiment with getting frustrated with my non-sticking Saran Wrap! Watched a snippet on YouTube of Natives collecting mussels under the ice! They must really love mussels-- it's pretty dangerous work! We also had fun with food this week! T LOVES hot chocolate so I used the Pioneer Woman's basic recipe to make White Chocolate Hot Cocoa, yummy! We also made edible snowflakes with tortillas and powdered sugar! 19 comments on "Very Last First Time: Five In A Row Unit Study"
What a great week. We haven't rowed the Very First Last Time yet so good to see all these ideas. The polar bears are amazing. It sure looks like you had a fun week! I love the igloo idea, I will be adding one to our Arctic Sensory Bin that I am making up this weekend! Thank you for sharing and linking up to stART! What great Arctic activities! My preschooler and tot will love the egg carton igloo building! What a great group of activities. I'm excited to Row this, and use some of these fun ideas. so many great ideas here! thanks for sharing on the Sunday Showcase. I pinned this on my Winter Pinterest board. Lots of great arctic activities! Great ways to bring that book life! My favorites are all the science things and experimenting with ice and water! Lots and lots of wonderful activities. Love the igloo and the visual discrimination file folder game, too. I've linked this post up on my VFLT post in the linky :) There is a graphic if you would like. I see you used my Sight Word Igloo paper. Thanks for showing it. I hope you kids liked it. I'm preparing to row this book with my girls next week and have found your post so helpful! Thanks for sharing!